The Kosmic Racing Department will be linedup from March 29th to April 1st on the Naples International circuit of Sarno. After the win in Muro Leccese, the Kosmic Racing Department will look for a replica on the occasion of the next round of the WSK Super Master Series: from March 29th to April 1st, in fact, the Naples International Circuit of Sarno will be the stage of recovery of the second round, deferred at the beginning of March due to the snow falling on the South Garda Karting of Lonato. The Italian track will also host the WSK Promotion series on the following weekend, too, April 5th-8th, which will assign the 2018 titles. 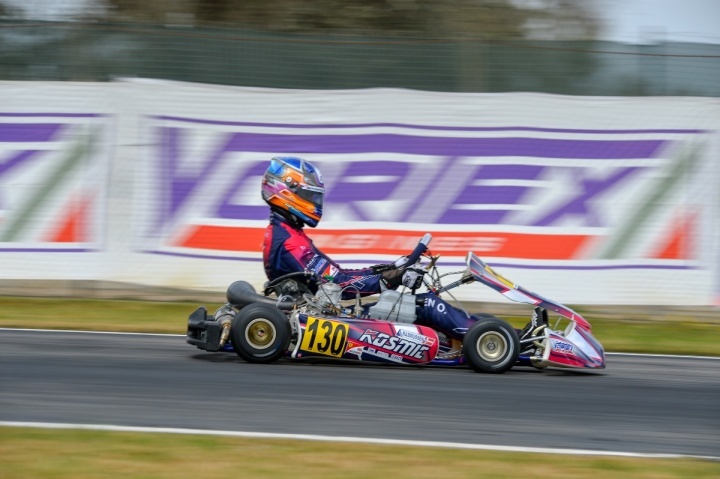 In KZ2 category Axel Bengtsson and Oliver Rasmussen are ready to improve the already positive result gained in Muro Leccese, in order to climb positions in the rankings. In OK class, Roman Stanek has the same goal, who on the Apulian track of La Conca brought home less results than he deserved for his performance: in Sarno, therefore, he will try to fit immediately in the fight for the victory, with the Swedish driver Viktor Gustafsson at his side. David Hadrien, however, will have the task of replicating the success achieved in the WSK third round, thanks to which he is now fourth in the OKJ category’s rankings: at this time, another placement in the top-ranking positions would be crucial to run for the title, to put on the bulletin exploiting the excellent potential of the Kosmic Mercury S chassis powered by Vortex. Alongside the French driver there will be the Brazilian Rafael Camara. In the 60 Mini class the young driver Jules Caranta will line up on the grid in what will be his second official appearance with the colors of the Kosmic Racing Department. The action on the track at the Naples International Circuit of Sarno will benefit from the live timing service via the www.wskarting.it website starting from the free practice on Thursday. The prefinals and the Finals on Sunday, however, will be broadcast in live streaming, always on the same website. Sunday 1st April: Warm-up, Prefinals, Finals.